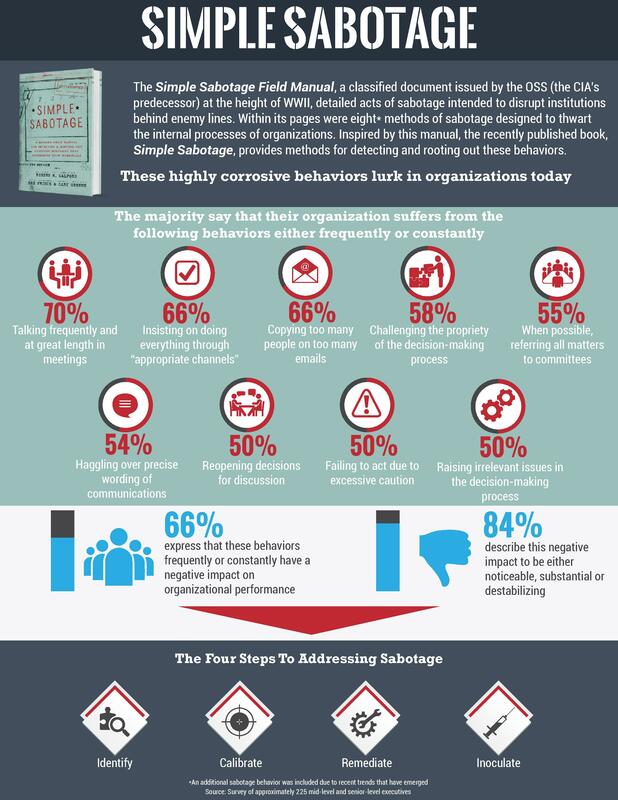 We surveyed approximately 225 managers to identify the extent to which their organizations are vulnerable to the negative effects of Simple Sabotage behaviors (even if they are not undertaken with malicious intent). As we suspected, we learned these highly corrosive behaviors lurk in organizations today. The Simple Sabotage Field Manual, a classified document issued by the OSS (the CIA’s predecessor) at the height of WWII, detailed acts of sabotage intended to disrupt institutions behind enemy lines. Within its pages were eight methods of sabotage designed to thwart the internal processes of organizations. Inspired by this manual, the recently published book, Simple Sabotage, provides methods for detecting and rooting out these behaviors.